The Muscogee (Creek) Nation operates several casinos within its Eastern Oklahoma boundaries, including the River Spirit Casino in Tulsa and the One Fire Casino in the Muscogee (Creek) Nation capitol town of Okmulgee, Oklahoma. Tribal gaming revenue has made possible the development of the College of the Muscogee Nation/MVSKOKE ETVLWV NAKCOKV MVHAKV SVHLWECVT. Through academic excellence and leadership, the College of the Muscogee Nation encourages personal growth, professional development, and life‐long learning. Of special significance to the development of the College is the Creek Treaty of 1866, in which Tribal leaders mandated a requirement for erecting buildings within Creek Country for educational purposes. A significant number of Muscogee College students are first-generation college students. The College emphasizes native culture, values, language, and self-determination, and provides an inspirational learning environment for students (tribal and non-tribal alike) to be engaged as citizens of their tribal community and with the global society. 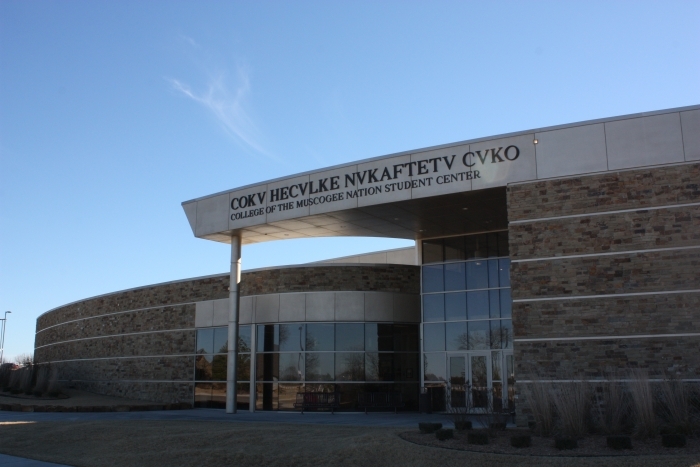 Muscogee Nation College is the only accredited and land granted institution of higher education in Oklahoma. Its $19 million (debt‐free) campus provides a $3.2 million economic stimulus to the region. For many Tribes, out of all the numerous benefits gaming revenue has provided, education stands at the top of the list. Gaming has made it possible for many to provide increased educational opportunities to students on and off of tribal lands including access to early childhood learning, summer youth and after-school programs, and the development of institutions of Higher Education.